Folks are tired of getting stuck in the mud and having to call in multiple tractors to get pulled out. Here’s what one farm bought to help with the pullouts. Two, twenty six foot long , 12 inch wide, 115,000 pound capacity straps and very heavy duty connectors. We do need to be careful what we use for pulling as inadequate equipment is very dangerous. Select a proper towing device. Don’t grab the first rope or chain that you find in the shop and use it as for a towing device. The towing device (rope, cable or chain) will be put under a significant pulling force or tension. Soil conditions and time or surface condition also need to be taken into consideration when choosing the proper towing device. If this device or a part of the device, such as a hook, breaks; the towing device suddenly becomes a dangerous projectile. While a one inch nylon rope has a stronger breaking strength than a cable or chain, when a nylon rope breaks it snaps back to its point of attachment. Steel cables upon reaching a breaking point will rebound in an unpredictable manner and wrap around any object in its path. 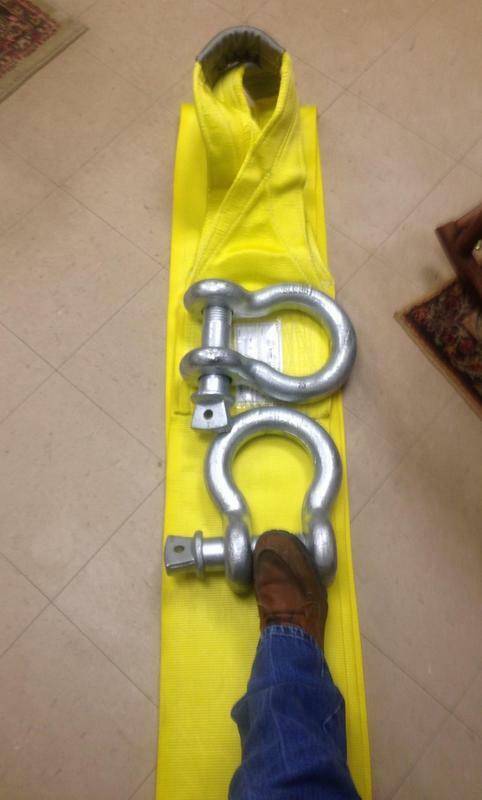 A long towing chain designed to support the towed load is recommended over nylon ropes or cables. Chains will break at their weakest point so check welds and hooks prior to use. Serious, disabling injuries and deaths have occurred when a towing device failed. Tractor and truck cabs may not stop the force of the towing device and the recoiling device may strike the operator. Attach the towing device to the pulling vehicle properly. If using a tractor it is important to attach the towing device to the drawbar. Improperly hitching to anything other than the drawbar significantly increases the chances for a rear overturn. Truck bumpers are not recommended attachment points as the pulling forces may take off the bumper and the bumper then becomes a flying object. Refer to the operator’s manual for additional safe towing information. More than one pulling vehicle may be required. In this situation, attach each vehicle with a separate towing device. Attaching vehicles in single file exerts too much power on the towing device between the second tractor and the stuck piece of machinery. Clear the area of unnecessary by-standers. Before starting to pull out the stuck machinery, clear the area of unnecessary by-standers and helpers. Ask these individuals to leave the area. Initiate the towing process with caution. Double-check all attachments to see that they are secure. If using more than one pulling vehicle, efforts will need to be coordinated carefully between all operators. Be sure that everyone is wearing their seatbelt and clearly communicate the plan with everyone involved in the process. Each operator should understand the situations that will stop the towing process. If using hand signals to communicate between operators, inform everyone of the hand signals to be used and what the motions will mean to them. When the towing process begins, apply power smoothly without jerking. At the slightest sign of danger, tractor front-end off the ground, slip in attachment of towing device, the towing process should be stopped and re-evaluated before continuing. Remember, the safest way to pull a stuck machine is always to use proper pulling equipment in good condition, attach it properly, and apply power slowly. Smallflower morninglory is important to be able to identify because it is different from the ipomea type morninglories. Some herbicides work on them but they don’t work on the smallflower morninglory. UGA Extension Scientist, Eric Prostko, has the following to say about late-season morningglory control in peanut. 1) Depending upon the anticipated digging date, 2,4-DB can be used to slow down the spread/growth of annual morningglory. However, this treatment will not provide any real control or result in complete weed death. 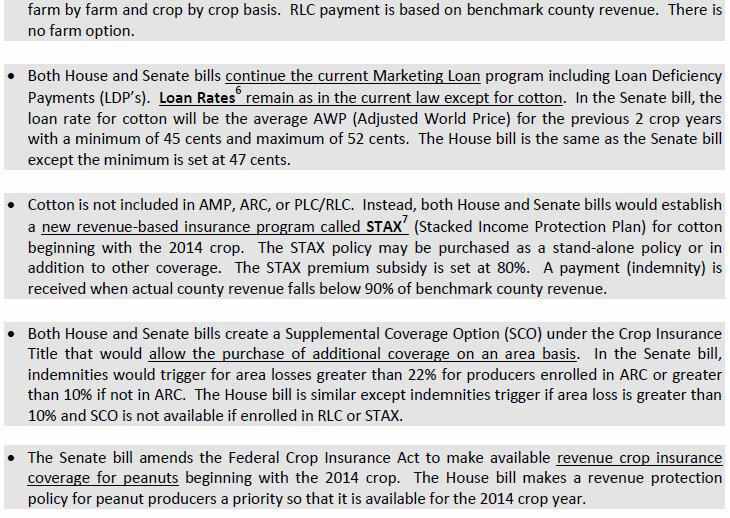 For convenience, 2,4-DB could be tank-mixed with a fungicide. 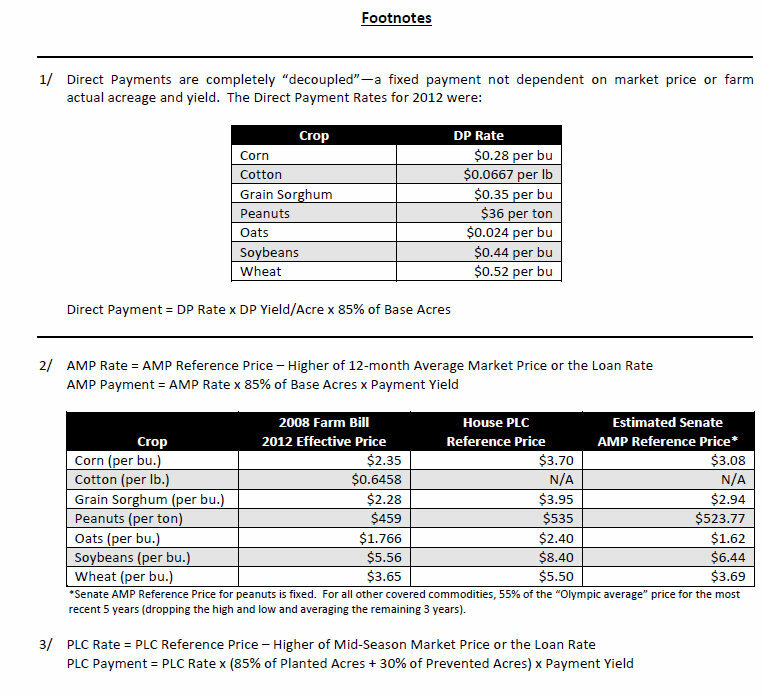 The pre-harvest interval (PHI) for 2,4-DB is 45-60 days depending upon the specific product label. 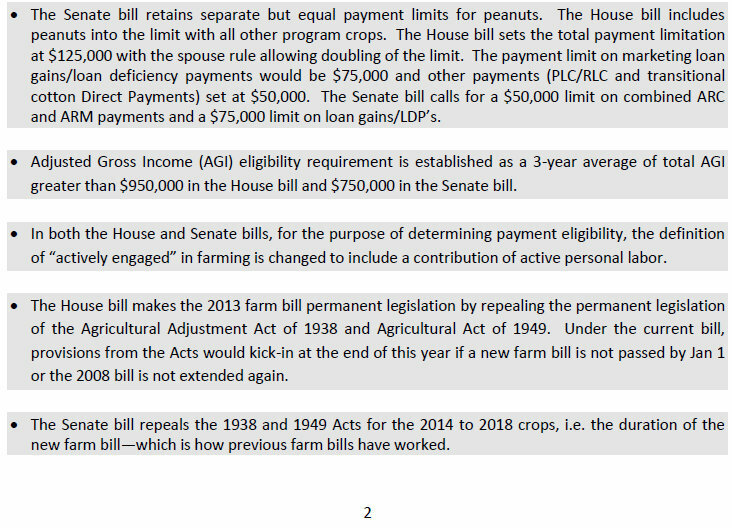 Only 2 applications/year of 2,4-DB are legal in peanut. 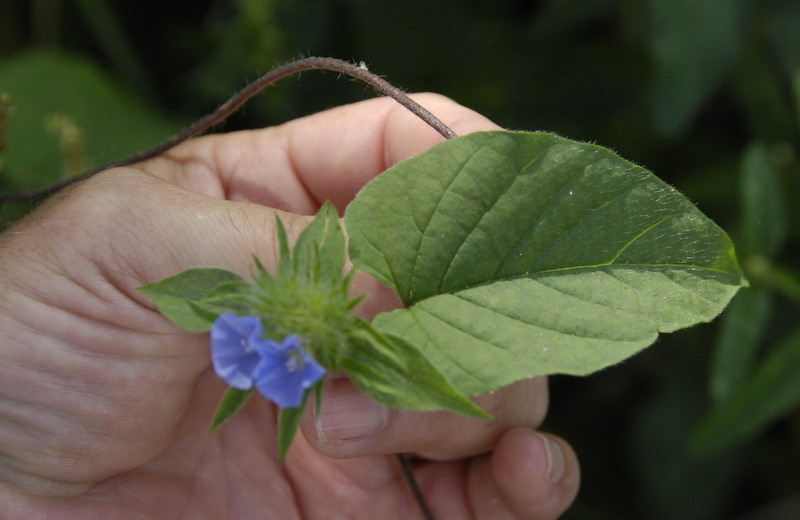 2) Aim 2EC (carfentrazone) can be used as a harvest-aid for annual morningglory in peanut (but not smallflower) . 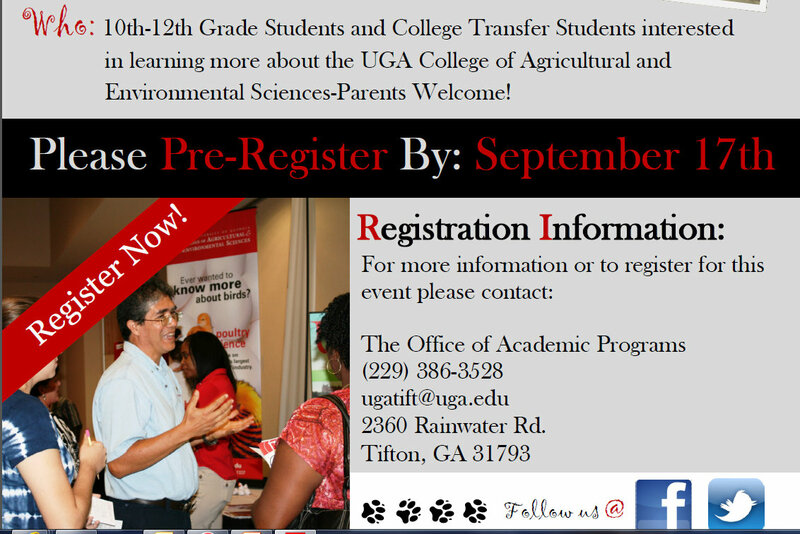 Please refer to page 448 of the 2013 UGA Pest Control Handbook for more info about this particular treatment. 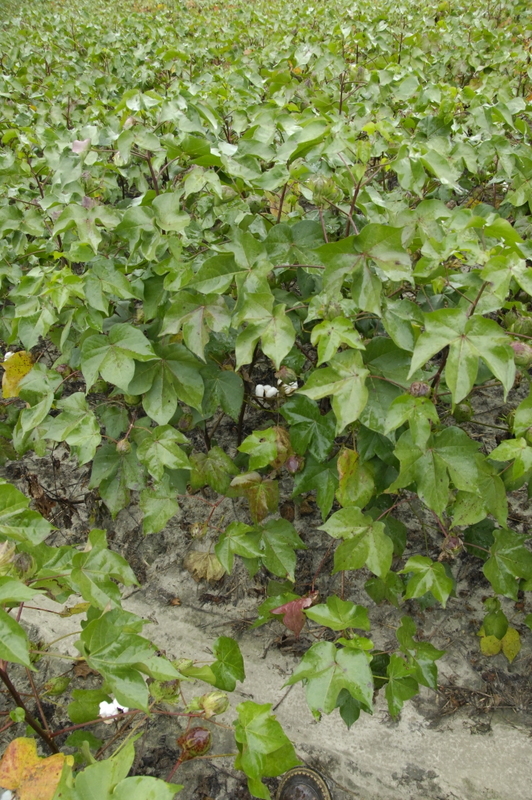 Applications of Aim will not provide complete control of large morningglories but Aim will make the stems brittle enough to improve harvest efficiency. ET (pyraflufen-ethyl) could also be used in a similar manner but I have less experience with ET than Aim. Both of these herbicides will cause minor peanut leaf burn. 3) Top-mowing can be a very effective method for removing unwanted weed-growth and improving harvest efficiency. 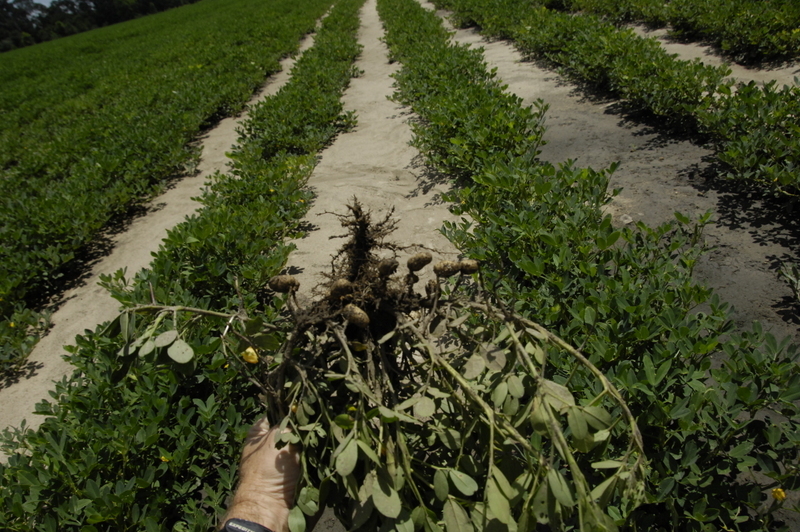 The top few inches of the peanut plants can be mowed just prior to harvest. 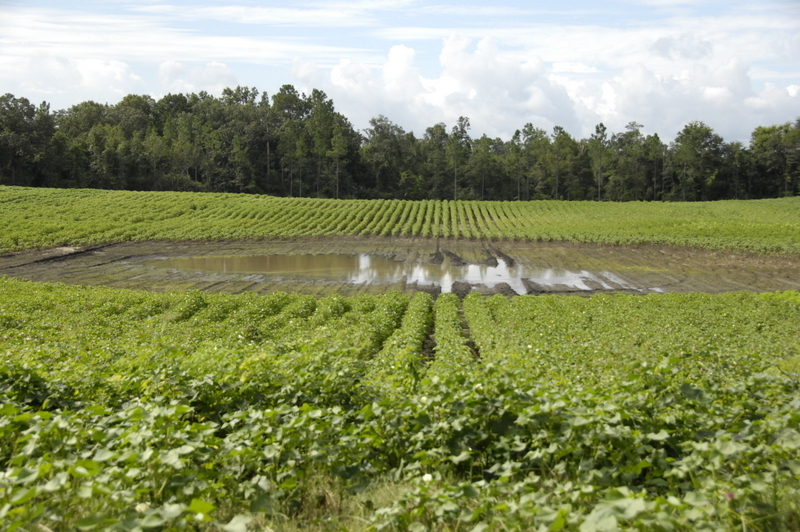 However, excessive top-mowing will severely effect the flow of the peanut vines over/through the digger. I prefer mowing with a flail mower (vertical blades) rather than a rotary mower (horizontal blades) since the rotary mower often leaves a bunch of debris on one side of the row which can cause problems. Top-mowing is a common practice that I use in some of my weedy research plots. This week’s question has to do with this photo I took this week. 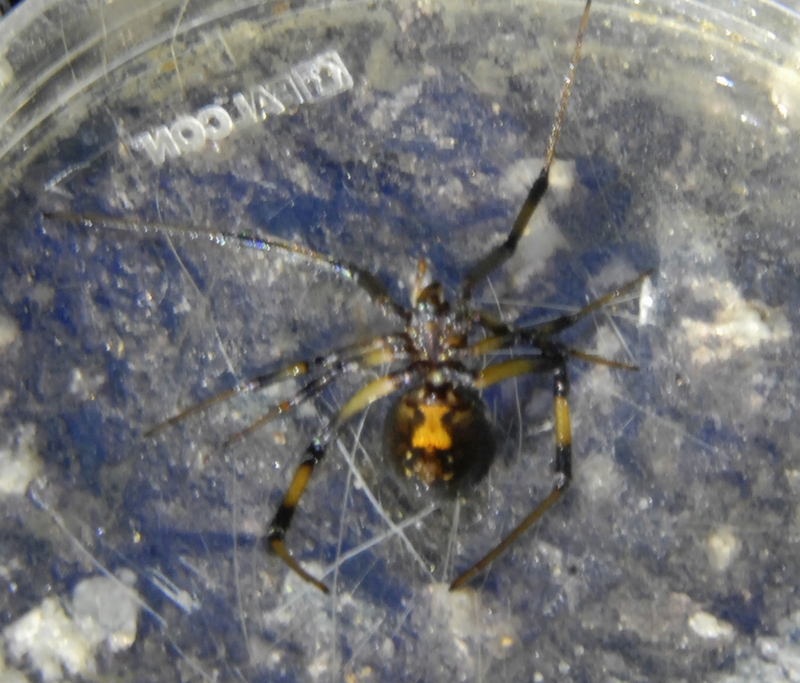 I was loading a kayak on the truck when my fingers got within an inch of this critter. What is it? 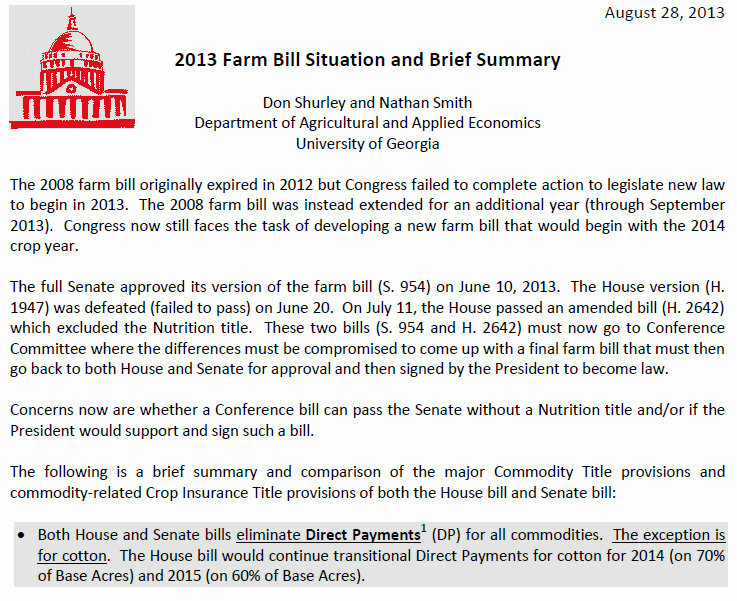 UGA Ag Economists, Don Shurley and Nathan Smith have a good publication they have just completed concerning the farm bill. 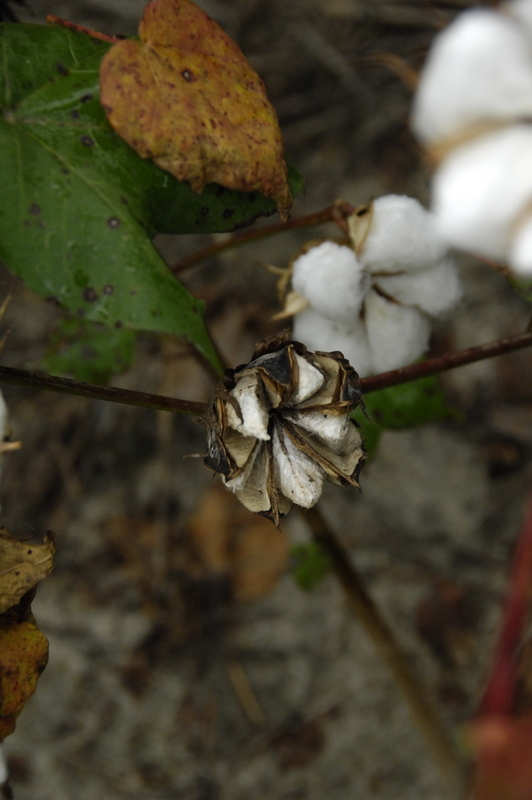 We are getting cotton boll opening in our oldest fields. Some is opening well but there is boll rot and hard lock occurring. Fortunately we had several days of scattered sunshine so that helped. These photos are from a very sandy field. Fields with heavier soils have on average about one boll open per plant. Loopers and other foliage feeders have been a pest in some fields. 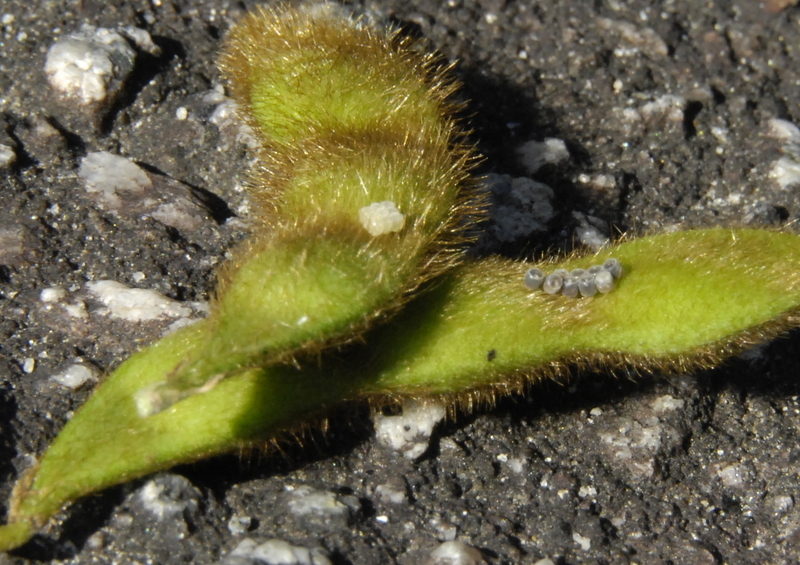 Also, kudzu bugs have been a problem and some older fields may have to have a second spray for them. What bothers me is the increase in stinkbugs in some fields. This field I was in this week had some stink bug egg masses. The dark ones are about to hatch and the creamy ones need a few more days. The grower will have to watch this field closely next week to determine if a stink bug spray is needed. 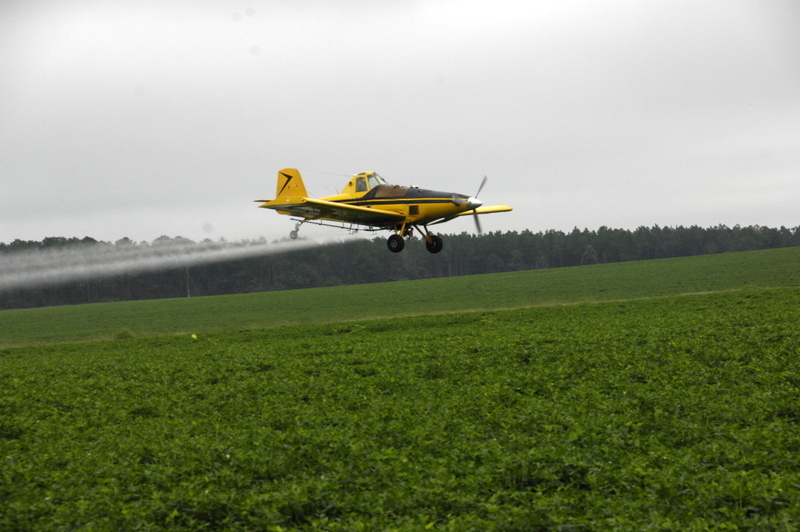 Peanut fungicides have gone onto many fields by air for a lot of this season. I’m thankful that we have the aerial applicators. 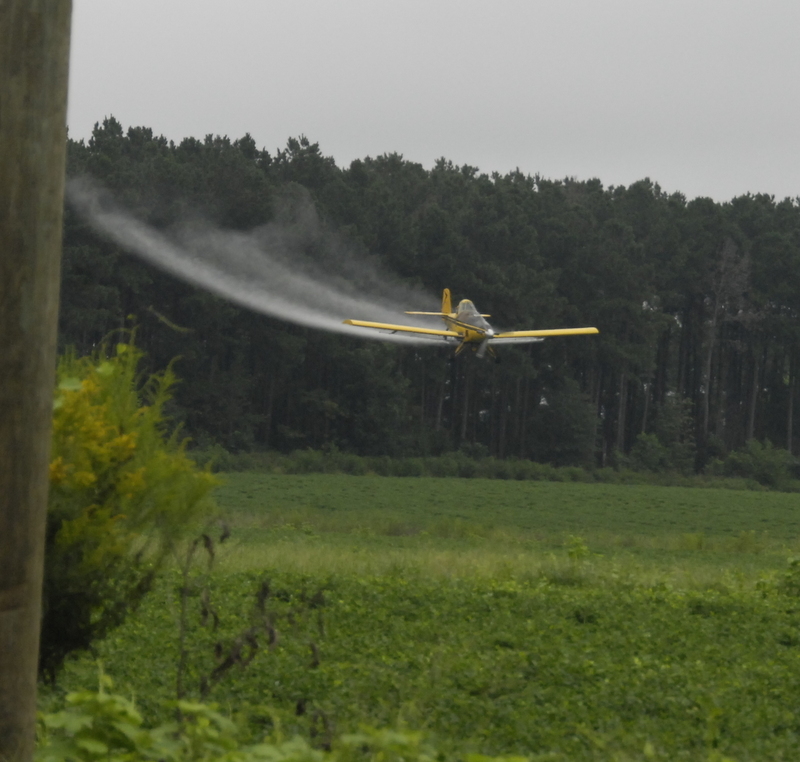 Here’s a field being sprayed for leafspot, whitemold and rhizoc. I was in a small dryland field last week that had not been sprayed well and the leaves were coming off of it and they will have to dig those peanuts early. If you are 2 weeks or more from digging and it’s been 10 to 14 days since your last spray, then another protective spray will be needed. Leafspot and peanut rust have been a problem as well as the soilborne diseases.. I’ve done a few peanut maturity tests this week and most Ga 06G’s are going 145 to 155 days, some are going longer. Dr. Mike Toews, UGA Entomologist, says that it is evident that we have a problem with grain protectant availability for the 2013 corn crop. He has visited with representatives from each company about these issues and will explain below. Regardless of the product used, please be mindful that grain protectants are not a silver bullet. Applications should only be made to cooled grain (do not apply straight out of the dryer) that will be stored for more than 3 months. 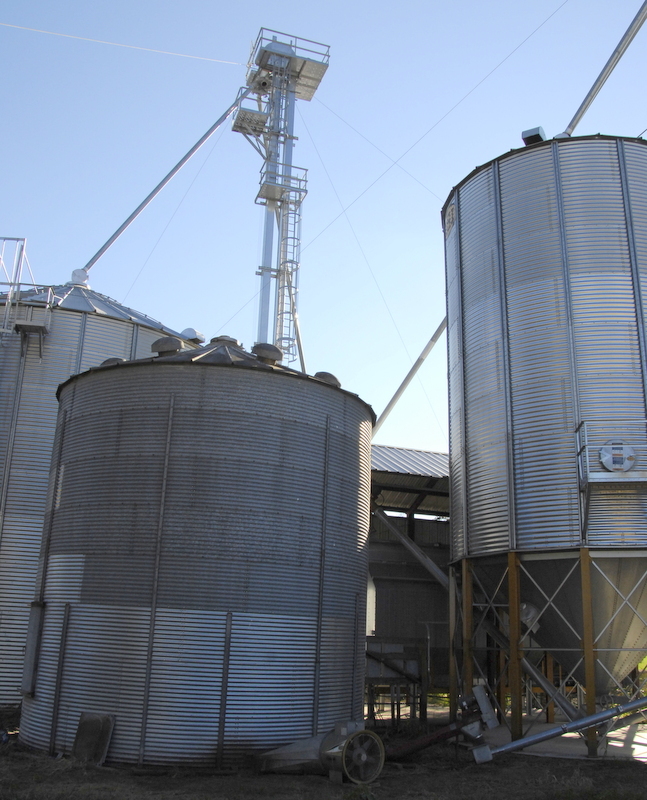 Long term grain storage also requires grain with a low moisture content, proper housekeeping, use of a spreader when filling bins, and managed aeration. Actellic 5E (labeled for corn). 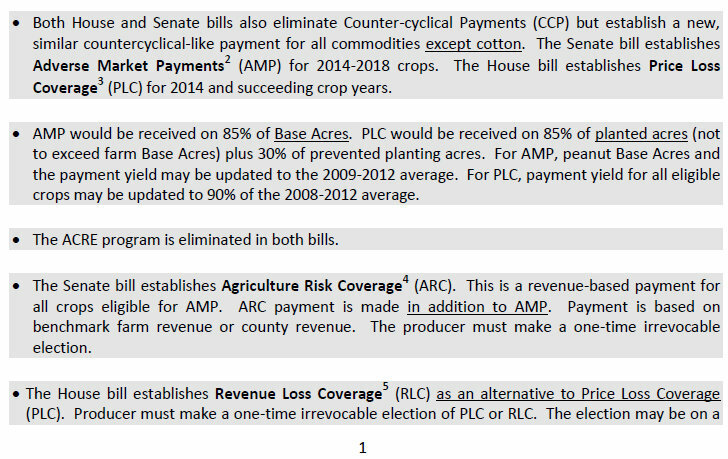 The current formulation is made by Agriliance, but distributed through Winfield Solutions, LLC and they have some current problems with distribution. A limited amount of product was available earlier this month, but most retail outlets are currently out of product and cannot get more. Centynal (labeled for corn and wheat). Centynal was released last year with little fanfare by Degesch America. 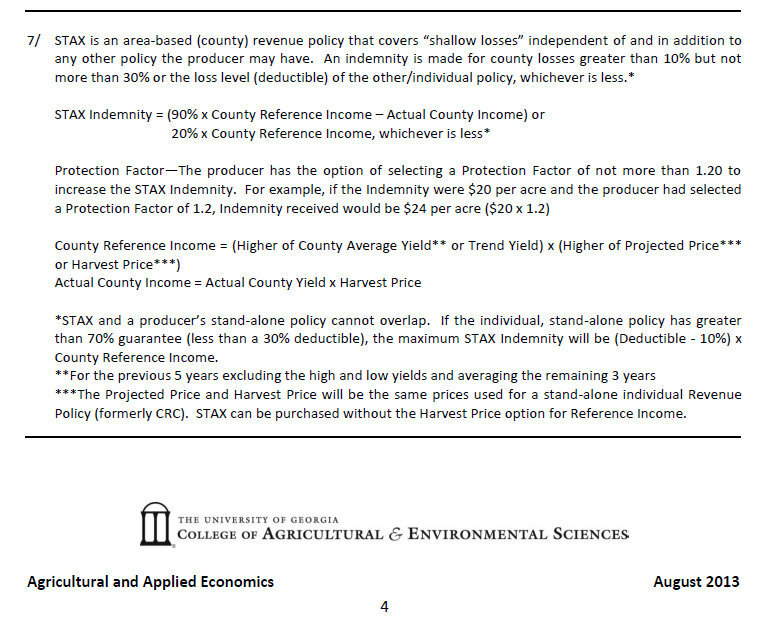 No one in the southeast has efficacy data at this point, but there is some data out of Texas that shows it performed well on stored sorghum. In the absence of Actellic, this appears to be our only option. 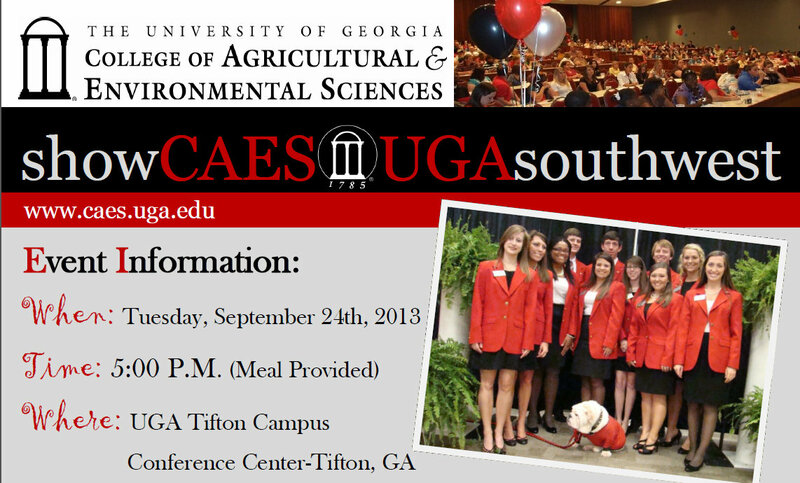 We will have Georgia efficacy data next year. Diacon (labeled for corn and wheat). Diacon is an insect growth regulator that is available in both liquid and dust formulations. Since it does not kill adult insects, it is not a standalone product but works very well when tankmixed. Diacon is effective at killing immatures that come into contact with treated grain. Unfortunately, this product will not work for any type of weevils since their immature stages are hidden inside individual kernels. Diacon is effective against lesser grain borers. Storcide II (labeled for wheat). Storcide II is currently the best option for stored wheat. To the best of my knowledge, availability has not been problematic and performance has been acceptable. This product is not labeled for use on corn. Malathion (labeled for wheat and corn). This product has been widely used in the past, but is not currently recommended due to well documented resistance in many stored grain insect populations. Sensat (labeled for corn and wheat). Sensat is a new product marketed by Bayer that has undergone extensive testing and shows excellent activity against all types of stored product insects. Unfortunately, there is no product being sold this year due to a lack of grain tolerances in key foreign countries. Execute (labeled for corn and wheat). Execute is the generic formulation of Sensat being marketed by Winfield Solutions. The label carries the following warning: “this product should be used only on crops and commodities intended for consumption in the United States.” Obviously, a grower should not use this product unless they have a contract to deliver directly to a US end user. I cannot find a dealer who has or can get this product. Tempo SC (labeled for empty bin use only). Tempo is an excellent material for treating empty bins and elevator boots, but is not labeled for application directly to grain. Thanks to Dr. Michael D. Toews, for this information. We have had over a year’s worth of rain and it’s still August. Here’s the numbers from our Donalsonville weather station. We’ve had over 60 inches and our yearly average is 54 inches. Here are the past years’ numbers for all year rainfall. We’ve had over 15 inches more than all of 2012 and 20 inches more than all of 2011. The soil is saturated after the additional 7 inches last week. 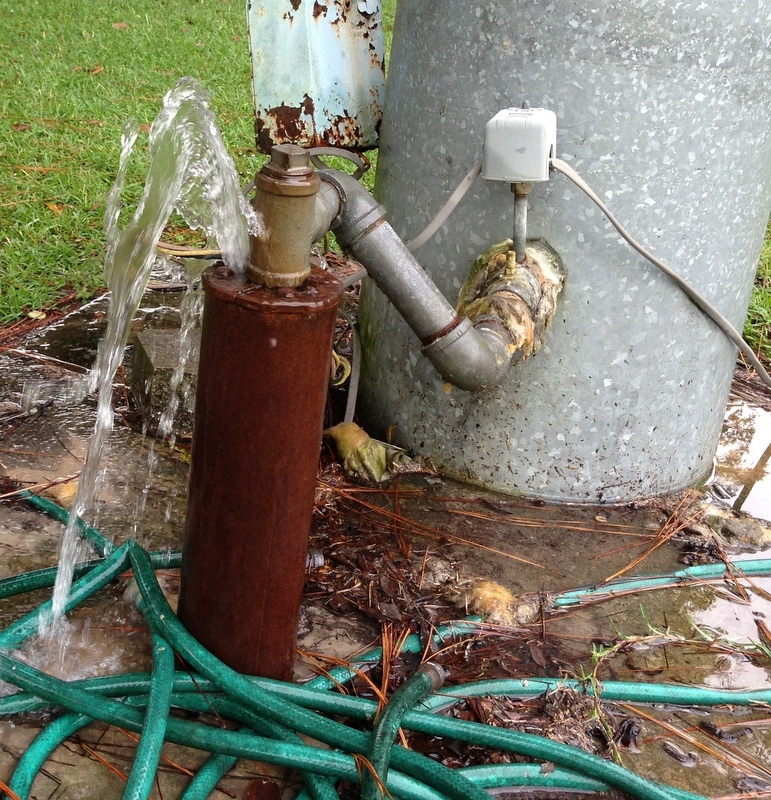 One of my neighbor’s wells is an artesian well now. So much pressure it’s blowing water out the top of the well caseing with no pump on. This well is near Fishpond drain. 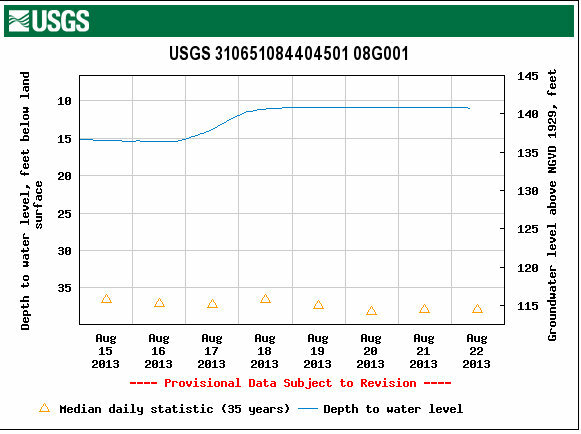 Our groundwater level is as high as I’ve ever seen it. Normally it’s 37 feet down this time of year and it’s 11 feet down at the test well. 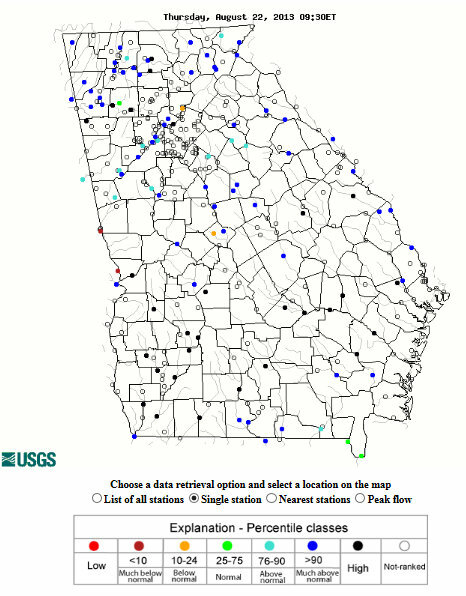 Most all Georgia waterways are high. Numerous wet areas in fields that will be low yielding. 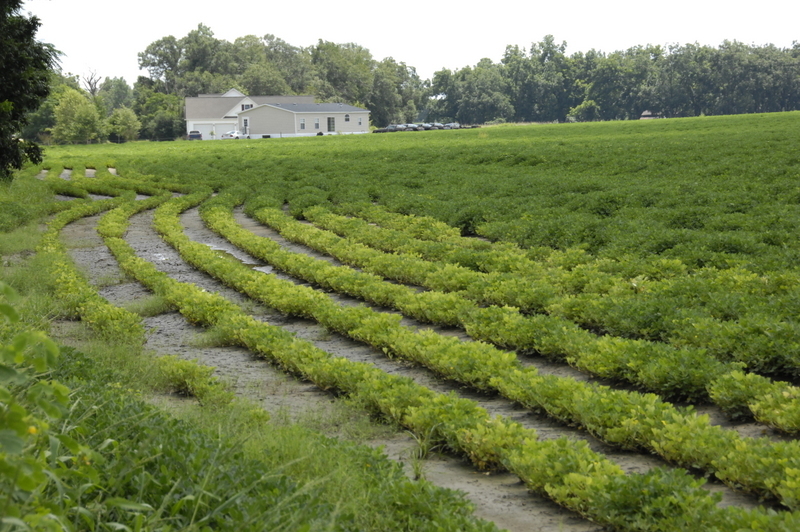 This peanut field received no rain for the first month of its life(planted May 1). June, July and August have definitely made up for it. And now we will lose yield in these wet areas. The areas that aren’t overly wet look good. We will likely have a good dryland peanut yield this year. 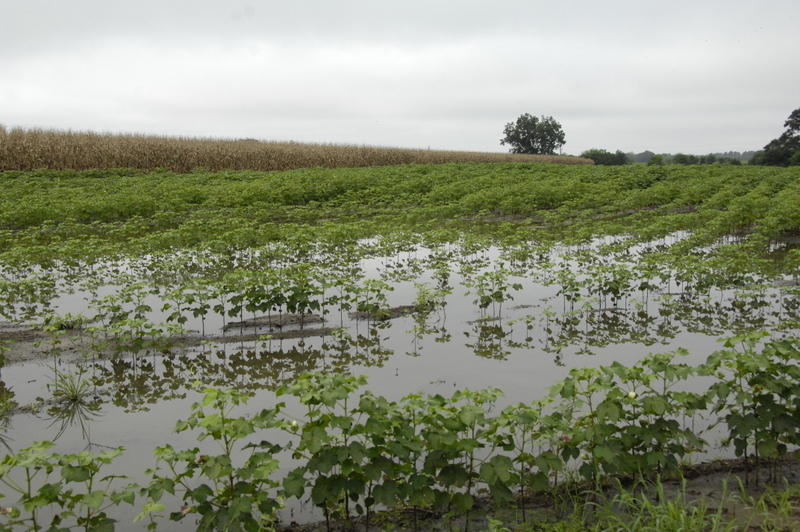 Here’s what the peanuts look like in the wet areas, not much on them. 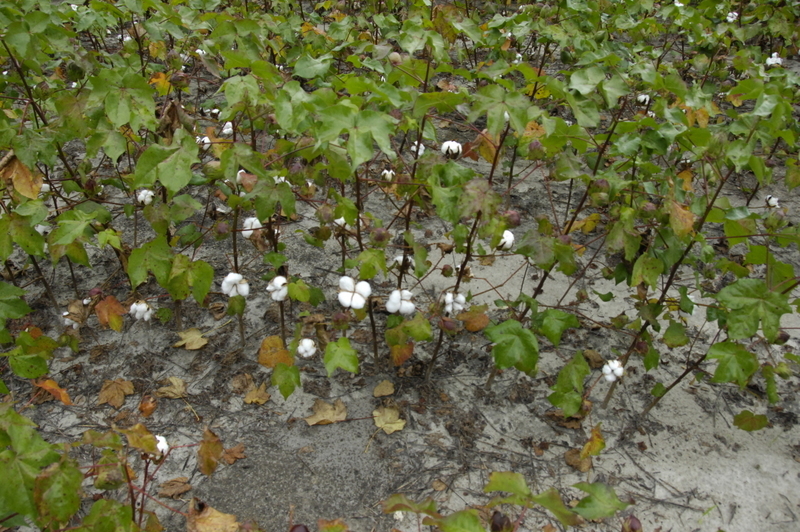 Cotton fields are inundated in areas and we are seeing a good many squares and young bolls shedding due to the weather. The crop growing behind Eddie in last week’s question was Pearl Millet. It is a great summer annual forage for cattle. It grows fast and can be used for a variety of purposes. This was planted after sweet corn harvest and is growing fast. It will also grow pretty well in drought conditions. Pearl millet originated in Africa and is the most widely-planted summer annual grass in Georgia. This tall growing, erect annual grass produces several stems from a central plant. As a result, it requires at least six to eight inches of stubble to regrow. 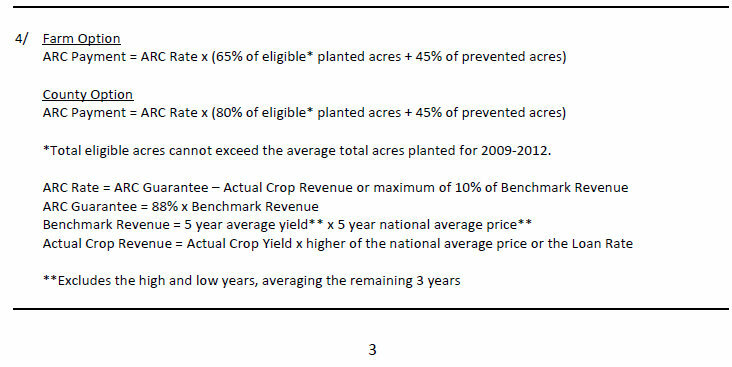 Improved varieties can produce more than six tons per acre. 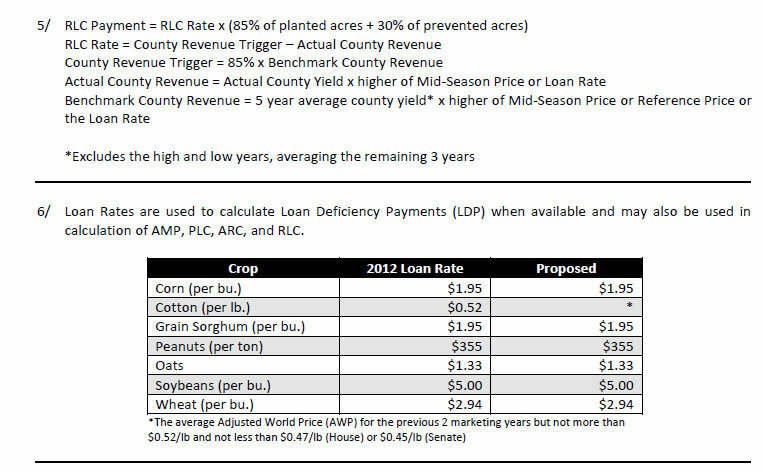 Even under moderate drought conditions, these varieties will rarely yield less than four tons per acre. Pearl millet can be grazed or harvested as hay or silage. Researchers at Tifton have found that pearl millet grazing should begin when plants reach 20 to 24 inches, but regrowth rate and animal performance is best if a nine to 12 inches stubble height is maintained. Pearl millet can make good quality hay if cut when plants reach two to three feet tall. This prevents the forage from maturing beyond the boot stage and therefore being too mature to provide high quality. The drying rate of millet hay can be sped up by the use of a roller/crimper-style conditioner. 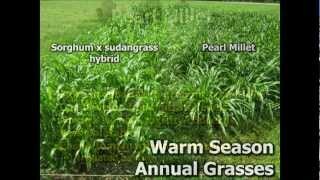 Here’s a great video done by UGA Forage Scientist Dennis Hancock, he talks about Pearl Millet and the Sorghum Sudan grasses. This week my question is about this plant. What is it and why is it important to differentiate it from other vines that are similar?